I would love to see Trump face this Dem ticket in 2020. We are seeing every loony leftist throw their proverbial hat in the ring .what would be your favorite ticket . Mine would be ......Anthony Weiner and Eric Holder. I can see the lawn signs now. 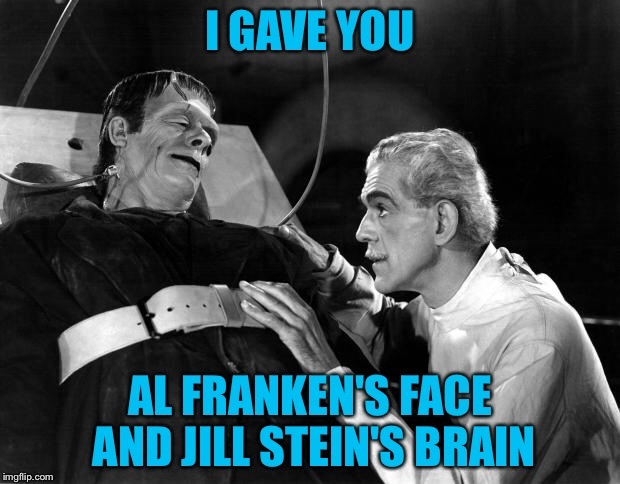 Al Franken and Jill Stein. Truth in advertising with that pair. Behave yourself! I can't stop laughing! Huma claimed to be divorcing him but she changed her mind the press didn’t report that.. Does he have a trust fund or something? Huma and the Wiener probably have an open ended hit contract out on them courtesy of slick Hilly if they do not do as they are told! The deep state need her to keep a lid on the boy? Maybe it has to do with not being a witness to her evil activity. You are a sick person! I can't stop laughing! That is a five star post! Careful I might sick my law firm on you .Dewey Scruwum and Howe. I honestly don't think that there is any better play on words for any possible current candidates. I think Beto and Kamala will be the winning primary ticket. Thats a young favored "new kennedy" and a black woman. I guess somewhere there might even be qualifications for the office, but I doubt it. Biden is OG and part of the past. Warren is a harpie, and Feel the Bern is a nice old man, but too socialist given the failures of socialism in venezuela right at our doorstep. Why would socialism work THIS time, when it never has before. After all, its results that counts, not the intentions of the socialists. There are some parallels between Bernie sanders and Berenie Madoff. Both pushed ponzi schemes. Maybe "feel the Bern" should be Bernie Sanderes' mantra, but it refers to the similarity to Bernie Madoff. Yes, but Anti-Trumpers are willing to dive on their shoes and take the bullet on behalf of "NONE" of use true conservatives, but who they believe need saving!